? Port Blair: Filled with places that suit every budget, here youa��ll be spoiled for choice. The Sea Shell and Fortune Resort are mid-level options while Sinclairs Bay View and Sea Princess have spectacular sea views. `8,000 upwards for deluxe rooms.
? A�Havelock : Pick a beach resort for the best experience. Barefoota��s host of A�options A�range from little huts, tents or sea facing deluxe cottages (`150 upwards). Having stayed at Sea Shell (`8,000 upwards) with a magnificent white seafront studded with coconut and palm trees, I would look no further. A mix of modern amenities and rustic charm, the cottages, chalets and lagoons are a real treat. Silver Sand (`12,000) should be your pick for luxury and Wild Orchid (`4,600 upwards) for quirky. Visit the Cellular Jail, in Port Blair, which used to hold back freedom fighters. Follow up with a goose bump-inducing light and sound show in the evening for a feel of the British invasion. Currently under Navy rule, Ross island was originally a lively British Barracks. Now, the cluster of clubhouses, bakeries, assembly halls, homes and the church, are shadowy ruins with trees reclaiming their territory, one building at a time. An old cemetery makes for an impromptu history lesson as do the bunkers left behind by the Japanese. We recommend a hike up Mount Harriet near the lighthouse at Port Blair, the image that features on the `20 note in your wallet. Part of the Mount Harriet National Park, it is the highest part of the Andaman and Nicobar Islands at a height of 365 meters. Following the trail along Mount Harriet, not only do you get a birda��s eye view of the surrounding islands but a good workout too. Beach No 7, or Radha Nagar Beach, in Havelock, voted the best in Asia, offers silky white sands with great swimming and snorkeling options while you explore the coral reefs and catch the amazing sunset. Stroll over to Blue Lagoon in the corner for a private pool experience. Eco-warriors must kayak through the calm mangrove creek from Havelocka��s Village No 6 to the jetty for a close-up of the diverse eco-system. Not only is it a quieter option to the roaring coast but the dense growth of trees is host to a large number of life forms such as shrimps, algae, barnacles, oysters, sponges, mud lobsters and mangrove crabs. If you are a lone ranger then the single seater kayaks are ideal. The double seater ones are easier to use and more romantic (or informative if the second paddler is the guide!). Hit South Button and Henry Lawrence islands for under-the-sea excitement and exquisite coral reefs. Anchored at the charming Tamarind Camp, we dived in to explore the grottos and undisturbed marine life, spotting stone fish pretending to be rocks, lionfish with defensive manes, pipe, cardinal and banner fish, manta rays, lobster and barracuda. Experts, in our case divers from Barefoot Scuba, will be happy to paddle along with non-swimmers in tow. Take an underwater camera to capture and relive the vast beauty later on an SD card! Should you tire of the unending white shores and waves, the two distinct water falls on Little Andaman are your best bet for something off beat. White Surf Water Falls near the port of entry at Hutbay jetty (which lends itself to sunbathing, snorkeling and swimming) and Whisper Waves, set a good 20 kms away from the jetty, are ideal for a bit of rock-climbing and canyoning. 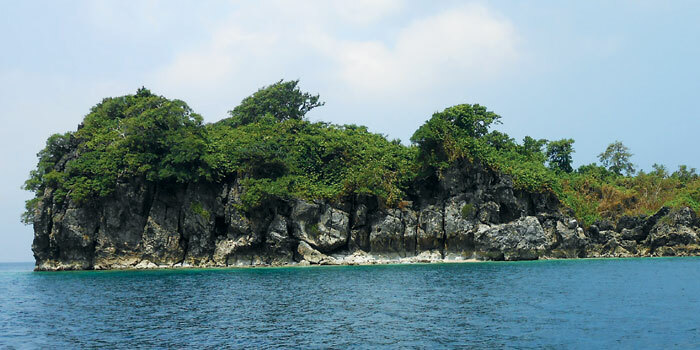 Avid surfers make Netaji Nagar your base in Little Andamans. A land based surf spot, this area sees South swells starting by mid-February through April, even May if the monsoon is delayed. Surf breaks here a�� high performance and barreling waves, are best for intermediate and above levels, not beginners. If you are intimidated by the deep waters, make a beeline to Elephant beach where they offer tandem jet ski rides, banana boat adventures and even an under-sea walk. The first spot in India to have this activity, the walk sees you don something of a space suit and walk in a cordoned off area breathing normally from the nose. Youa��ll get the real feel of the sub-marine life and the thrill is as good as a dive. The writer was invited by MakeMyTrip.
? Cinque Island a�� Clear emerald waters and even shark sightings. Best for experienced divers only.
? Bala Reef a�� Off Little Andaman, the reef is over 5 sq-kms and offers corals in every colour imaginable.
? Barracuda City a�� Suitable for more experienced divers, this spot even has turtles sometimes.
? Lighthouse a�� A shallow reef sticking out near the Havelock Lighthouse, this site is perfect for newbies even. Head out for a night dive if you are comfortable.
? Minerva Ledge a�� It has tons of fish and thanks to usually good visibility, shark sightings are a real possibility, making it a top site.